Time to Share My World again, and Cee has come up with some great questions this week. Definately English! Haha…see what I did there? I spelled definitely wrong. Seriously though, I loved English and creative writing. If you could have a servant come to your house every day for two hours, what would you have them do? 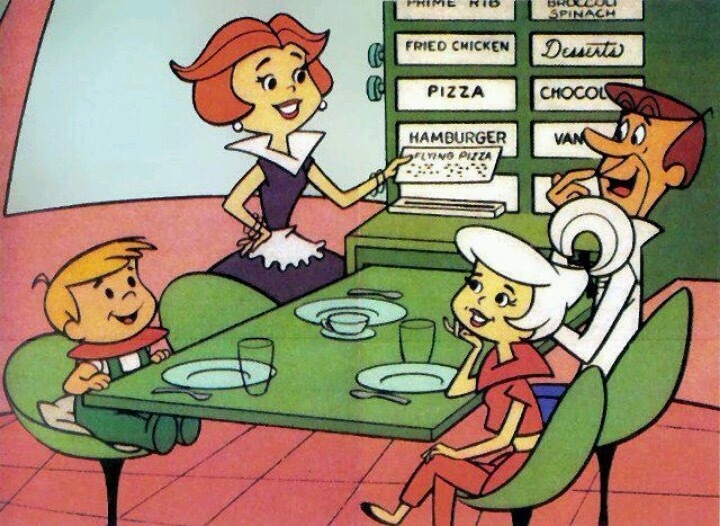 Remember the cartoon The Jetsons? They had a getting-ready-in-the-morning conveyor belt that brushed their teeth, washed their hair and made their breakfast. Yep. I choose that. Where did you live when you were in the third grade of school? Is it the same place or town you live now? Houston, Texas. I haven’t been back since I was 12, but I still keep in touch with the girl who was my best friend from 1st-5th grade. I could really go for a Cheese Enchilada from Mama Ninfa’s Mexican Restaurant right about now! In your opinon, list some places that are great for shopping? Target, thrift stores, Craigslist, the side of the road, well maintained recycling bins. All’s fair in love and bargains! I have a lot to be thankful for in the past weeks and I’ll make an announcement post soon w/photos. *Hint- It rhymes with we shot a mouse. Tags: blogging, challenges, gratitude, humor, SYW. Bookmark the permalink. Ooooh, ooooh! Bet I know what the secret is!!! Ooooh, ooooh! Ha, ha! Congrats, can’t wait to see. BTW, Jesse’s English teacher just sent back some criticism and she used the wrong right/write. Ha, ha! I told Jesse to take a screen shot and send it back. Hehehe. I KNOW you know! That is hilarious about the English teacher! Is he going to show her the mistake? I told him to but I don’t think he ever submitted it to her. I would push him to do it but I think he’s better off making up all those assignments he’s getting zeroes on! Love the picture of her replacing her head. Hilarious! I know. 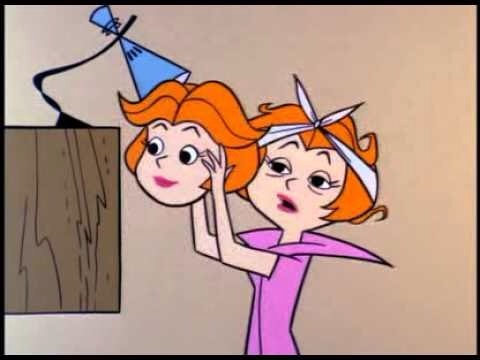 We women say we’re gonna “put on our face” when we apply our makeup, but Mrs. Jetson literally did it! I think I know what you did. 😀 Thanks for sharing. I loved the Jetson’s!!!!! I’m thrilled for you on the good news and can’t wait to read about it and see it! Yeah…I’m still waiting on that Jetson’s tech to go live! Can’t wait to share more about our good news. Stay tuned! I’ve been blogging (jury’s out on that one 😀 ) for two years now and I STILL spell definitely wrong and I actually laughed out loud just now because I did again! TY for making me laugh this morning! Awe! That’s so funny, and thank you!